The Summer Associates Program provides many of its interns with valuable work experience, lasting professional relationships and unforgettable summer memories. For some, hard work has translated into careers at UPMC! I had the chance to speak with Catherine Flynn, a 2013 Summer Associate, who has gone on to become a member of the ISDR program, a highly competitive position that assists in producing the future leaders of UPMC’s Information Services Division. Catherine, a Pittsburgh resident for the past 15 years, graduated from Duquesne University where she majored in Health Management Systems. This program provided her with the knowledge to interface between health care, business, and information systems. 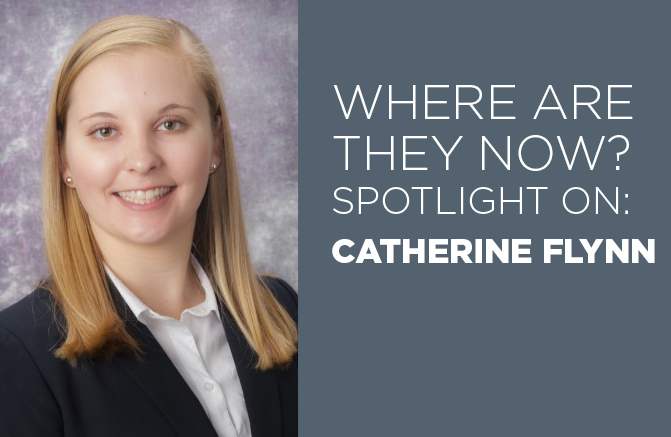 Catherine’s unique skill set led to her position with the Message Router Team in Enterprise Systems and Data Management during her time as a Summer Associate. As a team member she worked on daily tasks and projects, as well as assisted in developing Visio documents for the team workflows and processes, specifically working on a PASIIS project for immunizations. Her experience with the PASIIS project helped Catherine to network with other departments including EMPI, Data Quality, Enterprise Analytics, and Interoperability. Catherine’s favorite memories from the Summer Associates Program are the networking events with UPMC executives. The opportunity to learn about the progression of their professional careers and receive mentoring from the organization’s leaders was an extremely beneficial part of her summer. After completing her summer internship, Catherine stayed on as a part-time member of the Message Router Team as she completed her degree. Following graduation, she was able to join the ISDR program as a full-time employee. As an ISDR Analyst, Catherine will rotate through four unique departments within Information Services, spending only six months with each team. She must quickly develop new skills in each department and successfully complete her projects and daily jobs, as well as transition her work to the next person when her time with the department is finished. Catherine has now completed two of her rotations, the first with the Epic Ambulatory eRecord team, and her second with the Enterprise Data Quality Team. Having a background in a health care related field, one of her favorite experiences was working with several physicians to complete a project that directly impacted patient care. Catherine will transition to her third rotation with the Enterprise Project Management Office in the coming weeks. For Catherine, the Summer Associates Program was an excellent opportunity to demonstrate her professional determination and her commitment to improving health care in her own community. For those interested in becoming Summer Associates or for employees interested in advancing their careers, she emphasized the importance of doing everything you can to set yourself apart from the crowd, whether it be accepting new challenges in school or the workplace, developing a new skill set, or becoming a leader in your organization. UPMC is on the cutting edge of health care and it will remain there with the commitment of its employees and its continued recruitment of future industry leaders and innovators. The UPMC ISD Summer Associates Program is an opportunity for college students who are interested in Information Services to experience what it is like to be a part of the “Most Wired” Hospital System in the country. For Summer Associates like Catherine, who are truly passionate about building the best health care service, UPMC provides a foundational platform to develop and direct that desire. For those interested in becoming a Summer Associate, please visit UPMC’s careers site to learn more.